Earlier this August researchers from our group and from the Center for Biomaterials and Tissue Engineering in Valencia, Spain, published a paper about how subtle changes in the surface chemistry of synthetic materials, made with copolymers of acrylates, can control the conformation of fibronectin. This is a protein of the extracellular matrix, with important roles in adhesion and differentiation processes. This small material changes are also proved to affect cell response when cultured on substrates coated with these materials. Dr Patricia Rico, from the team in Valencia, explains the results presented in the paper in this post. Material substrates for tissue engineering applications intend to mimic the natural niche environment and are usually expected to trigger regeneration of cell population. The key to success of material systems is on their integral inherent properties, including chemistry, surface modifications, topography and stiffness. Protein adsorption from culture media or physiological fluids is the first step of regeneration process followed by cell adhesion. Initial cell adhesion plays a fundamental role in subsequent cell behaviour. Several biological molecules participate in cell adhesion such as Extracellular Matrix (ECM) proteins, cell membrane and cytoskeleton proteins. These molecules further interact, and transmit specific signalling information that promote transcription factors and finally regulate gene expression. So, the molecular cues produced at the cell-material-interface are crucial already at the beginning of interactions. Fibronectin (FN) is a protein of the ECM that plays a fundamental role in mediating and promoting cell adhesion and other cellular processes. Its interaction with integrins promotes cell-mediated FN fibrillogenesis. In previous works, we have shown the ability of poly(ethyl acrylate) – (PEA) to promote the organization of fibronectin into physiological-like (nano)networks in absence of cells, a process that we have called material-driven fibronectin fibrillogenesis, and we also demonstrated how subtle chemistry variations can influence the FN network formation as FN adsorbed onto PMA (poly(methyl acrylate) acquires a globular conformation instead. In this paper we modulated the degree of fibrillogenesis of FN after adsorption onto surfaces using a series of copolymers with controlled acrylate/methyl acrylate (EA/MA) ratio. Figure 1 shows AFM images of FN conformation onto different copolymers. We obtained different degrees of fibrillogenesis in dependence of the EA/MA ratio composing the copolymers. The interconnection and density of fibrils composing the network decreases as the content of MA increase in the samples. Adhesion. We wonder now how cells could response to different FN-networks obtained onto the copolymers. We first examined initial adhesion of myoblast cell line analysing vinculin as a marker of focal adhesions (essential for adhesion of cells). 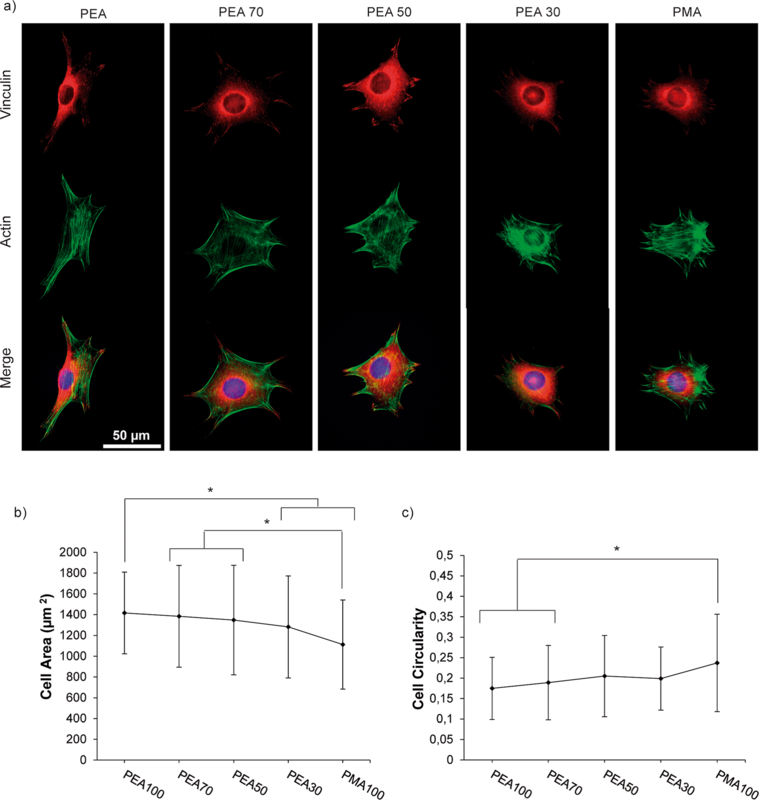 Figure 2 shows attached cells with well-developed focal adhesions on all substrates regardless of the composition of the copolymer and subsequently the degree of fibrillogenesis. Differentiation. We next evaluated the influence of different degrees of FN fibrillogenesis on myoblast differentiation. 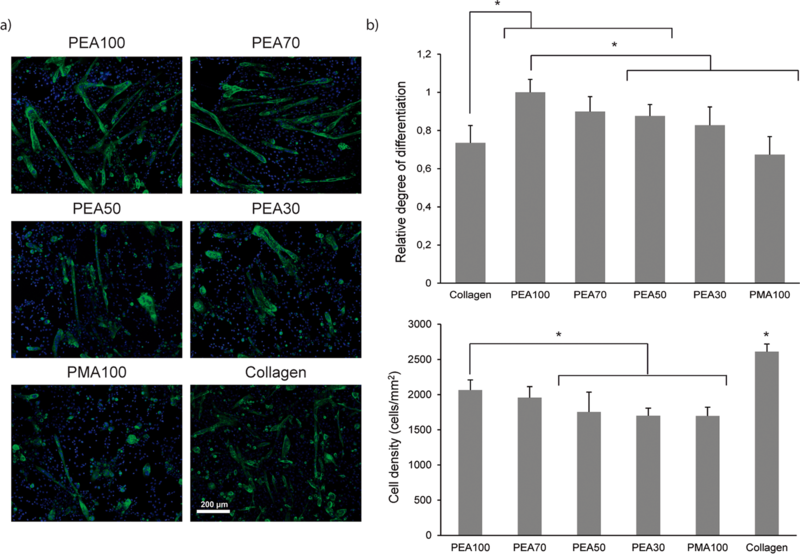 Figure 3 shows that PEA and copolymers with higher EA content presented the higher levels of differentiated cells, even higher than the control collagen substrate considered to be the gold standard for myoblast differentiation. 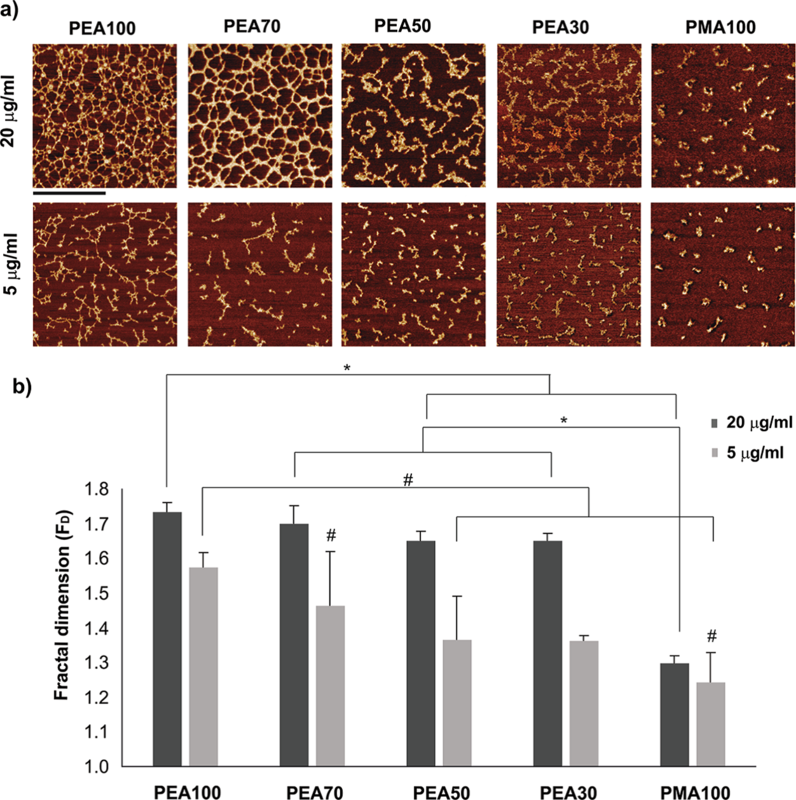 The fraction of differentiated cells decreases monotonically as the content of EA does reaching the minimum levels on PMA substrates on which FN is adsorbed in a globular conformation. Our results demonstrated a direct relationship between myoblast differentiation and distribution of FN into nano-networks at the material interface. Contractility. Activation of cell contractility is necessary to promote differentiation. Contractile forces generated for actomyosin machinery results from dynamic interactions between actin and non-muscular myosin that further activate diverse associate proteins playing important roles in several cellular processes including muscle contraction and cell differentiation. In order to assess the role of different degrees of FN nano-networks created in terms of cell contractility we evaluated the potential to induce differentiation of different substrates using an inhibitor of contractility (blebbistatin). 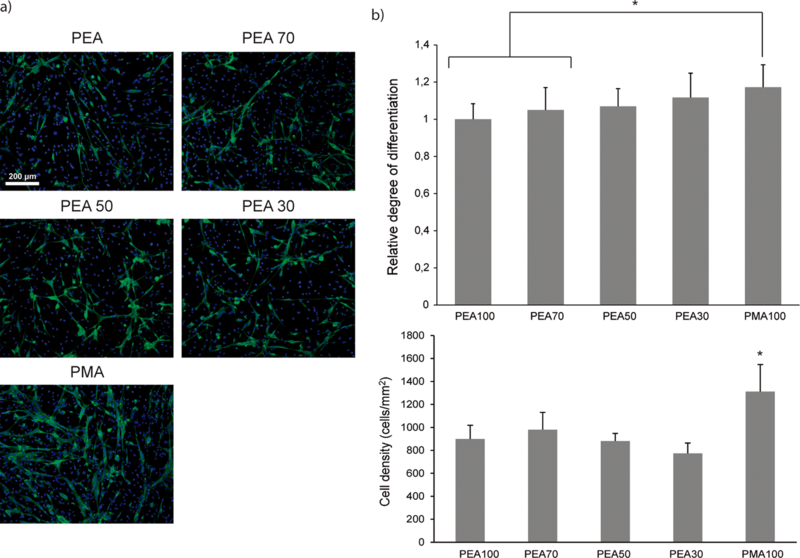 When blebbistatin was added to the culture medium, cells differentiation dropped significantly only on copolymers showing higher degree of FN fibrillogenesis (higher content of EA ratio) whereas it had no effect for cells on globular FN (PMA). Our results suggested a direct dependence between the degree of fibrillogenesis, activation of cell contractility and level of cell differentiation (Figure 4). Overall our results corroborate a material system capable of control the degree of FN fibrillogenesis upon simple adsorption that can be incorporated into novel strategies to modulate cell response in the area of Tissue Engineering. Our platform has the potential to become an effective approach to engineer advanced microenvironments that control the number of cell adhesion sites as well the amount of growth factors used in the system to promote cell differentiation in vitro and tissue repair in vivo. ACS Appl Mater Interfaces. 2015 Aug 19;7(32):18125-35. Epub 2015 Aug 10. Mnatsakanyan H1, Rico P1,2, Grigoriou E3, Candelas AM1, Rodrigo-Navarro A3, Salmeron-Sanchez M3, Sabater I Serra R1. 1 Center for Biomaterials and Tissue Engineering (CBIT), Universitat Politècnica de València, Valencia, Spain . 2 Biomedical Research Networking Center in Bioengineering, Biomaterials and Nanomedicine (CIBER-BBN), Valencia, Spain . 3 Division of Biomedical Engineering, School of Engineering, University of Glasgow, Glasgow, United Kingdom .